Things I Learnt from my (Unscientific) Experiences with Crowdsourcing. Last Friday, I had a chance to try out a new talk at Northern Voice, and I think it went fairly well. Anyway, this talk was mainly a fun and slightly irreverent go at providing some advice around the act of creating crowdsourcing projects. It was less about being strategic and having grand visions, and more about the value of not being afraid to just forge ahead and experiencing the outcomes be they negligible, small, or large. Part of the reason for this less than compelling direction is due to the simple fact that I’m not really an “expert” of the internet (I self identify as a scientist and teacher) – I’m really just a willing and interested dabbler, who sees value in using the web for advocacy and literacy work (in my case, science literacy). Anyway, here were the main points with links to the personal (science themed) examples I provided. Hope you enjoy! Crowdsourcing is a process that involves outsourcing tasks to a distributed group of people. This process can occur both online and offline, and the difference between crowdsourcing and ordinary outsourcing is that a task or problem is outsourced to an undefined public rather than a specific body, such as paid employees. 1. Just try it already. One of the best attributes of crowdsourcing projects, is that they can be incredibly easy to “just have a go.” More so when you consider that at its heart, crowdsourcing is just a fancy word for getting others to play along with your idea. This means that these projects don’t always have to be fancy convoluted things (not that there’s anything wrong with that), but that sometimes having a simple idea can be just as rewarding. I used Puzzle Fantastica as an example of this: Here, Ben Cohen and I decided to host a puzzle back in 2006. It began with a cool and appreciably stupid name, and then a taunt, ““Do not click unless you are of reasonable intelligence.” Next came a wonderful dump of hypotheses generation from commenters far and wide, and if you’re interested in more, you can get a sense of the whole delightful process in this piece that I wrote. All to say, that I think this nicely shows how easy it is to embark on something that entices “others to play.” In this case, we didn’t actually plan anything! 2. It’s o.k. not to take things too seriously. Sometimes, I think people equate crowdsourcing too much with notions like fund raising, being strategic, having a pertinent vision, and other phrases that sound both fabulously important and dull. In reality, for most of us, it doesn’t need to be so serious. Plus, you never know… by doing something that you yourself find amusing, you just might find that others will feel the same way. Which works, because after all, you just want to get others to play along. honest, I kind of f***ing hate dolphins” badge. For this, I mentioned a little science culture venture that some colleagues of mine (the awesome Anne Casselman, Jennifer Gardy, and Jeffrey Helm) and I started a couple years back. It’s called “Science Scouts” and, in to be frank, it’s a little hard to explain. Best just to head over to the site and peruse through the badges and their accompanying stories (trust me, you’ll waste at least a few enjoyable minutes there). Needless to say, Science Scouts (I think) is awesome, and as clear a departure from seriousness as you can possibly imagine. 3.Targeting a community is key. 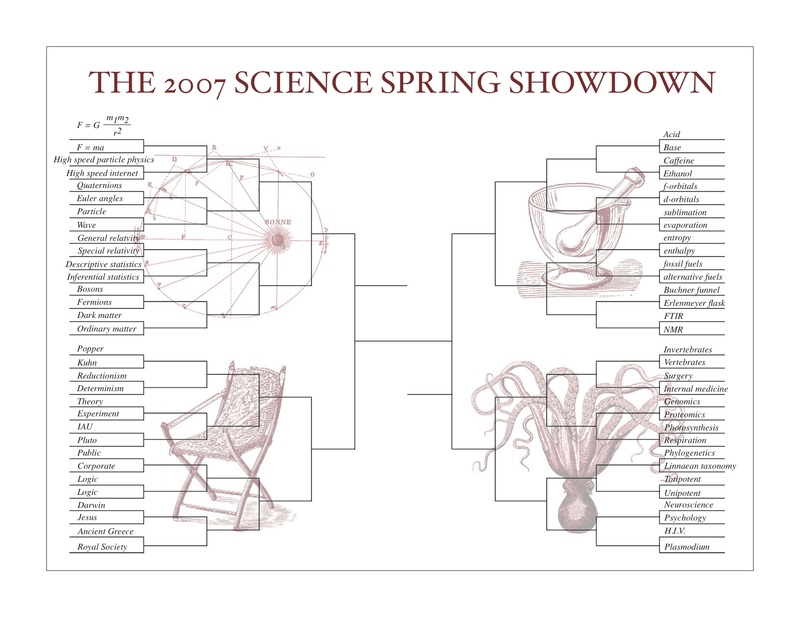 For this section, I talked about the time that Ben and I decided to host a SCIENCE SPRING SHOWDOWN! Basically, what we would do here, is imagine the mother of all basketball tournaments. Except in this case, the players would all be thematically science flavoured. Here, we had invited folks from the science blogging sphere (esp. the great folks at scienceblogs.com, many of whom were professors or journalists) to contribute a piece of fictionalized writing: one that would pit various scientific terms against each other in bone crushing NCAA style action. What we got was a brilliant collection of work, that was not only fun to read, but also nicely demonstrated that the sciencegeeks among us are also incredibly creative at heart. And in relation to the piece of advice above: in the end, I think this little crowdsourcing project succeeded because we really understood the community we wanted to court. 4. Make the work easy. 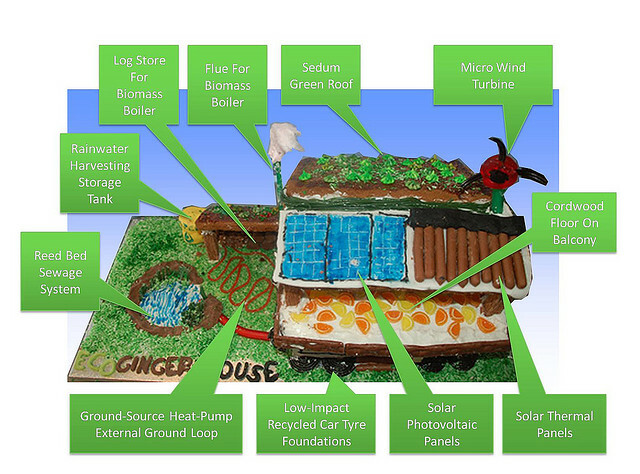 The idea to host a sustainable gingerbread house contest was the brainchild of Dave Semenuik, a grad student who was working with me at the time. Asking people to make a model house, and specifically a sustainable model house, is a big request. But asking them to make a sustainable gingerbread house during the Christmas season… Well, who isn’t going to have a go at that? Especially, since we also said that “there would be judging (although no prizes).” Point is: this one worked because we piggy backed on an existing activity, so it wasn’t a stretch to hope for a good turn out. Lots of fun, and I think we might just have another go this year. p.s. here is what the winner looked like. For the uninitiated, “twee” is not short hand for “tweet.” It’s a word defined as, “Excessively or affectedly quaint, pretty, or sentimental.” Why it helps is that the twee, or the unconventional, or the non-sequitor, all of these things are often quite helpful in attracting interest to your crowdsourcing projects. From a purely observational vantage, it’s clear that the web loves this stuff – why else are there so many somewhat unexpected memes? But I actually think it makes sense for these off-kilter inclusions to have such effects: especially if you following the ins and outs of personalized behaviour in how web content is presented to us. In other words, search algorithms tend to filter everything one sees, such that the content you see is pretty much the content you expect to see. Therefore, if you want expand the reach and diversity of people checking out your project, you need to add a little something unexpected to your mix. 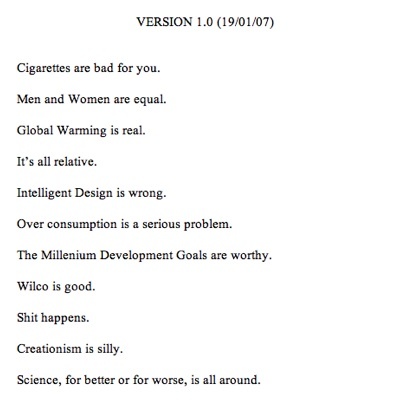 In 2006, Ben and I, began a fun exercise in trying to come up with a way to illustrate the finer nuances of peer review. What we needed was some kind of topic that could galvanize the participants (in a friendly way), and Ben came up with a brilliant one. Labeled “The Candy Hierarchy,” it was an attempt to rationally rank candy according to their desirability. Add to that, the clever release of this ranking around Halloween, and we were set with some interesting activity right off the bat. This went on for a number of years, often generating dozens of comments/feedback, but things really took off when in 2010, we had the chance to host the Candy Hierarchy at Boing Boing, a very influential blog, with a traffic base far exceeding whatever reach, Ben and I would normally have. Not surprisingly, this took the Candy Hierarchy to a completely different level. The lowest tier on the Candy Hierarchy. I think I had to go through close to 500 comments to revise the hierarchy for 2011. On a peripheral glance of the comments on Boing Boing for 2012 revisions, and also the comments on other sites that shared the chart, I would not be surprised if peer review will be closer to 1000 comments the next time around (plus, we have a surprise data set that was mentioned in my talk). This one is pretty obvious: it helps to know influencers who enjoy your quirky (and in this case, science themed) endeavours. Which brings us to the last piece of advice I had on my slides: that is, when you get the hang of things, try to do some good. In the end, I’d say that all of my previous examples had an element of good in them, particularly from an advocacy point of view. But I do admit that they were, in combination, a handy test run for a current project I have going which has much bigger aspirations. And it’s a doozy: Not only is it a fairly nuanced piece of crowdsourcing work, but it’s one that requires activity from the scientific, artistic, gaming, computer programming, education, and even IP law front. But so far, it’s been amazing. Essentially, it’s amorphously building a trading card culture around biodiversity – and all open source, open access too (i.e. cards are free!) You should definitely check out the site, maybe even download a starter deck to play, or maybe you have an idea you’d like to pass by for one of the high quality decks that are starting to get produced. Better yet, if you have some WordPress chops, you can help with one final hump that needs passing for this thing to really take off (this concerns making the DIY section easy enough for a 7 year old to post their own card)! Anyway… Here are my points altogether. 3. Targeting a community is key. I should add that if Phylo was something of interest to you, and you also happen to be based in Vancouver, you should definitely check out an event coming up at the HIVE on July 5th. As well, if you’re interested in joining other Vancouver based Science Scouts for a friendly round of drinks and good cheer, follow my twitter feed at @ng_dave or the Science Scout one at @sciencescout Usually a crowd of science communicator types (from journalists to teachers to academics to other interested creative folks), numbering anywhere between 4 to 30 would gather at the Railway Club, pretty much every first wednesday of the month, 6ish pm on.